I love this knife ! 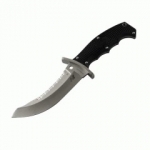 its real calling is outdoor survival type work camping , hunting- don't let the battle look fool you its great outdoor knife. I would recommend the 5.5"over the 7" unless your in a military battle situation ! Expensive knife but worth every penny ! Just don't go out an try to chop a tree down with it, theres axes and saws for that kind of work ! branches are fine, cutting para cord, small wood work , food..exc. Great fit and finish, but less thought behind it than the Pacific. Great size for an EDC knife in the military. Comfortable and safe for stabbing and heavy cutting. Surprisingly comfortable, I would rate higher if the tang was not exposed over the scales. It fits the Spec-Ops sheath nicely in both orientations, something excellent when allternating between belt/leg carry and vest carry, and also for left handed users. The smaller size feels like an improvement, it may be less fragile than the 7 inch Green Beret. It is also lighter and more useable. The unsharpened back edge is acute and great for opening boxes without wearing out the edge. 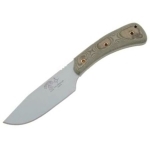 Of all four medium sized CR knives, it is probably the most utilitarian along the Neil Roberts Warrior. 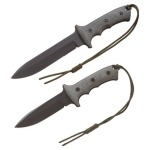 Would recommend to soldiers that like knives and want something more, but only for a discount price. I bought mine for cheaper than retail, I cannot justify spending 350$ on a knife, or using it afterwards. I love this knife. It is light, made from excellent steel. It is easy to grab in the dark and tell where the edge is.